Upto 30 seats after laid down process of written test interviews and Medical. 15 seats each for Pre-Medical and Pre-Engineering (variable as per class structure of existing cadets promoted from class X within CCW). Candidates with less than 70% marks in matriculation will not be entertained. 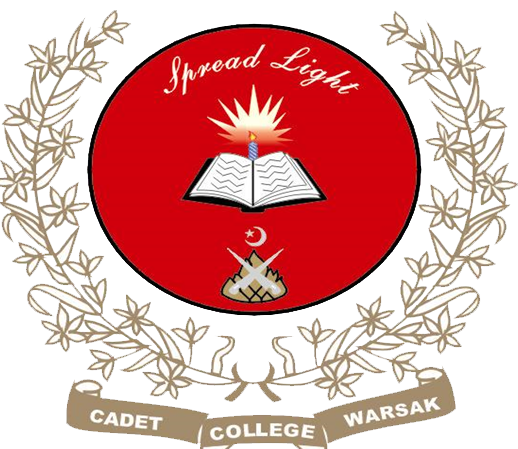 The College is affiliated to the Peshawar Board of Intermediate and Secondary Education for Matriculation and Intermediate. Science subjects are offered at the Matriculation stage. At the Intermediate level, there are pre-Medical and pre-Engineering groups. English is the medium of instructions and cadets are encouraged to speak to one another in English. Teachers speak to cadets in English except in the Urdu and Islamiat periods. Parts of speech,articles and punctuation. Changing sentences into interrogative and negative forms. Antonyms / synonyms, singulars and plural. Essay / paragraph, letter / application writing or building a story from a given outline.